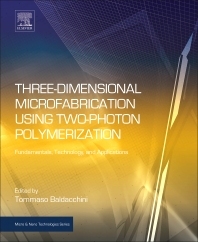 Three-Dimensional Microfabrication Using Two-Photon Polymerization (TPP) is the first comprehensive guide to TPP microfabrication—essential reading for researchers and engineers in areas where miniaturization of complex structures is key, such as in the optics, microelectronics, and medical device industries. TPP stands out among microfabrication techniques because of its versatility, low costs, and straightforward chemistry. TPP microfabrication attracts increasing attention among researchers and is increasingly employed in a range of industries where miniaturization of complex structures is crucial: metamaterials, plasmonics, tissue engineering, and microfluidics, for example. Despite its increasing importance and potential for many more applications, no single book to date is dedicated to the subject. This comprehensive guide, edited by Professor Baldacchini and written by internationally renowned experts, fills this gap and includes a unified description of TPP microfabrication across disciplines. The guide covers all aspects of TPP, including the pros and cons of TPP microfabrication compared to other techniques, as well as practical information on material selection, equipment, processes, and characterization. Current and future applications are covered and case studies provided as well as challenges for adoption of TPP microfabrication techniques in other areas are outlined. The freeform capability of TPP is illustrated with numerous scanning electron microscopy images.